This product cost me £10 and is in a 110ml white bottle with a black spray nozzle which makes it very easy to use. The nozzle has a clear plastic cap. 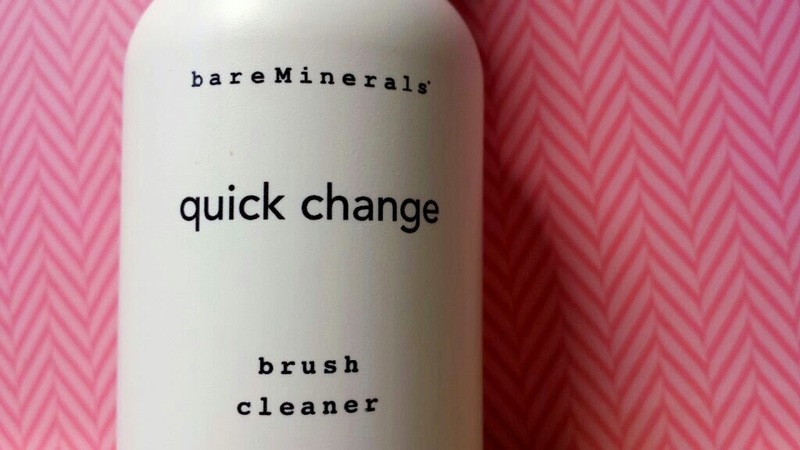 bareMinerals Quick Change brush spray is a make-up brush cleaner. It is designed for a quick clean of brushes so you can use the same brush with a different product instantly without pigment contamination. 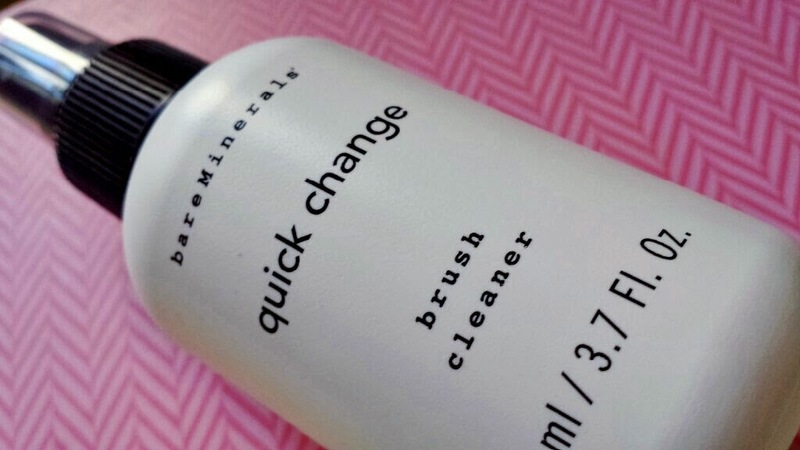 It is not a full on cleaner and it is not an excuse to not clean your brushes regularly! 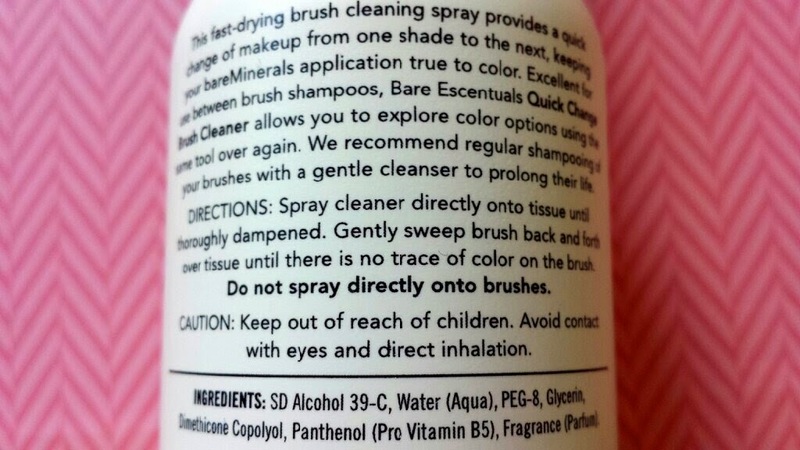 To use this product, it states that you need to spray it onto a tissue until it is sufficiently dampened. Next, you need to sweep the brush you wish to clean over the tissue until the brush is clean. This product is very quick and easy to use. It adds about 1 whole minute to my routine. This product works amazingly on brushes that are used for powder products. I also tried it with brushes that I use for cream products and it doesn’t work anywhere near as well. I still use it for those cream-product brushes though as it does help to keep them clean in between cleaning! I usually plan to clean my brushes when my little man is asleep, but for some reason he always wakes up just before I start or he decides that he doesn’t want to go to sleep that night etc. By time he falls asleep I usually end up asleep too. This usually means that my brush cleaning gets postponed by another day. Having this brush spray puts my mind to rest a little! I know that if I had to put off cleaning for another day then I have this as a back up. In the end I usually always manage to find the time to get my brushes sparkly clean and good to go again, but using this every day to keep my brushes cleaner between washes is a huge help for me. The only downside is that I feel to sufficiently dampen the tissue I need a fair few sprays. The bottle isn’t the hugest, so this does wind me up a bit as it can occasionally use up too much of the product. To overcome this, I now use kitchen tissue instead. The absorbency and the strength of the tissue is far better so you also don’t get that horrible tissue fluff (you know what I mean! The bits that fall off the tissue or leave fluffy bits behind! Just me?). Another thing that may be a downside for other people (but not for me) is the smell. It has a very strong smell to it, but I find it very pleasant! However, some people may be put off by this and should proceed with caution if that will be a bother to them! I bought my bottle for £10 from Debenhams, but you can find it online a little cheaper at places such as Escentual (£8 at the time of writing this). However, you will need to pay for delivery (unless you spend £30) which bumps the price back up and ends up costing more. The trick for buying this at the best price is to think about when you’ll be picking it up. Out shopping already or near a department store whilst you’re working? You might as well pick it up whilst you’re out. Buying a beauty haul online? You may find that it works out cheaper to buy online. Is it worth buying though? Well, that really depends on whether you would have a reason to. If you don't use makeup brushes then obviously there is no need! However, if you do have a collection of them that you need to keep on top of cleaning wise then it can be incredibly helpful!